Editor’s Note: This article first appeared in the Arizona Republic. The author has granted Fill Your Plate reprint permission. If only my own Dad were here to sop up this mouthwatering meal! I can promise you, he would have ripped off a big hunk of fresh crusty Italian bread and mopped up every last drop of this slo-cooked Short Ribs in Red Wine sauce dish, and then pressed three fingers and thumb together kissing them and sending his hand to the air! “Delicioso, Janina!” he would have said. For this recipe, Dads, we going to take you away from the cooking method you know so well– the grill, and direct you to the countertop where a couple of pounds of meaty short ribs, sauteed onions and red wine are slow cooking away in a Crockpot. We want to spend time with you on your special day, so no more than fifteen minutes of prep time in the kitchen and then let the magic of the slo-cooker do the rest! 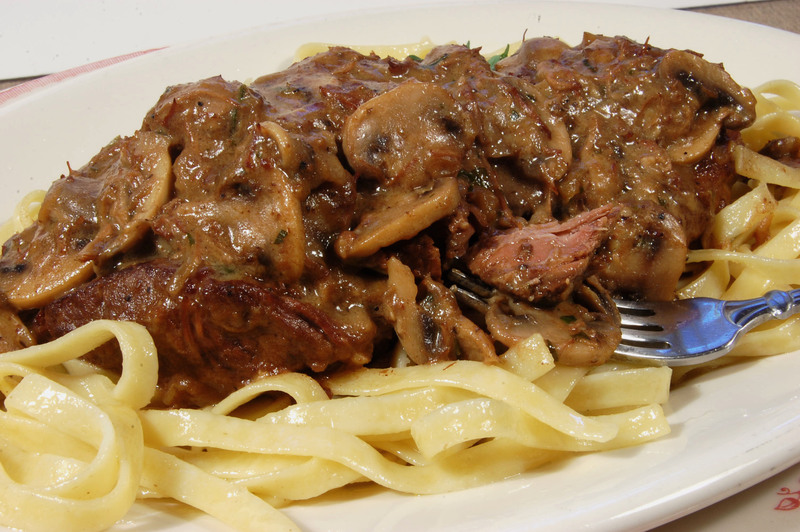 Later we’ll finish off the dish by topping the meat with sauteed mushrooms. 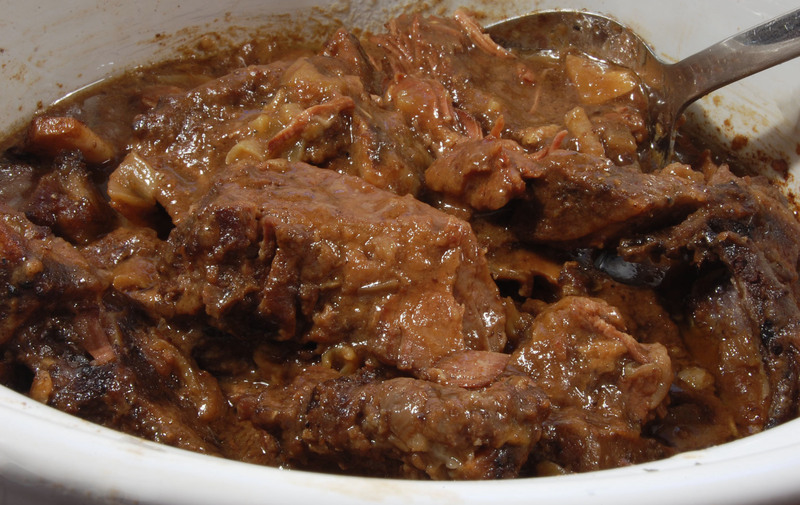 This recipe for Short Ribs in Wine and Mushroom Sauce was adapted from a favorite family dish from the five generation ranching family, the Tomerlin’s with Arizona Legacy Beef [and participants on Fill Your Plate]. Danny and Kacie Tomerlin often serve this up for big family meals and special occasions. It’s one of my new favorite “simple and slo-cooked” recipes. In large skillet, heat oil over medium high heat. Coat short ribs in flour and place in hot skillet. Sprinkle with salt and pepper. Add garlic pieces, (do not burn). Brown short ribs well on all sides. Place in slow cooker with garlic. In the same skillet sauté onion slices in butter for about 3 minutes. Transfer to the slow cooker and spread over short ribs. Swirl red wine in the skillet with a whisk or wooden spoon scraping up the browned bits left in the skillet. Transfer to the slow cooker. Cover and cook on low for 8 to 10 hours until short ribs are tender. Just before serving, sauté mushrooms in 1 tablespoon butter and parsley in large skillet until tender. Remove the short ribs to a serving platter keeping warm. Pour the liquid from the slow cooker into the skillet with the mushrooms. Simmer, scraping up the pan juices until the sauce has thickened. Remove the skillet from the heat. Stir in the sour cream and return to heat just until heated through, do not boil. Pour sauce over the short ribs. Garnish with fresh parsley. This entry was posted in Arizona farmers and ranchers, Cooking, Recipes and tagged Arizona farmers, beef production, local food, recipes. Bookmark the permalink.